Do not be ashamed if you are suffering from Acne. Many people around the world suffer from this problem. Still, we can understand this is a problem you want to fix. Do not worry. There is a solution. You do however need to be persistent. There is no miracle ointment. To find a solution to your problem, it is always best to find out what causes the issue. A troublemaker for acne is hormonal change. This means you are more likely to get acne in certain phases of your life such as puberty. It also says that some people are more likely to get acne than others. Some people are also more likely to get severe acne while others only get mild forms. 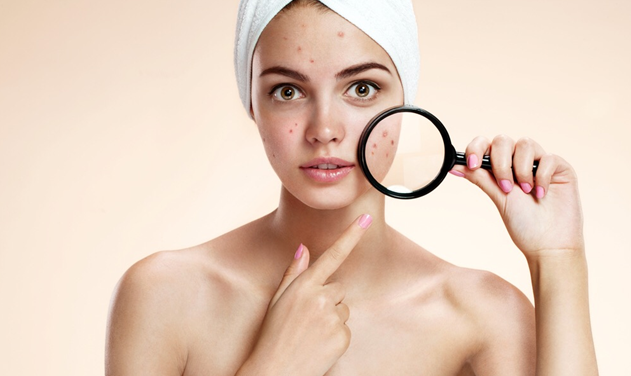 So what are the causes of acne that you can prevent? Two things can aid your acne. One of them is kind of obvious and is on that most people focus on to clear the acne. This is personal hygiene. The other one is less obvious. What do you eat and drink? Acne is actually infections caused by clogged pores. Dirt clogs the pours, tallow gathers and can’t get away. The bacteria trapped in the pours can cause disease. This, in turn, causes inflamed skin. The hormones can cause extra tallow production and can speed up this process. It can also create a greasy skin where dirt sticks to easier. To prevent good acne hygiene is essential. Wash your face twice a day to unclog the pours. This way bacteria will be less likely to accumulate and cause infection in the pours. As mentioned above a greasy skin makes for a more dirty face. Especially the infamous T-zone (forehead, nose, and chin) can be particularly oily. This is not always caused by hormonal changes, but can also be caused by an unhealthy diet. When you eat a lot of greasy food, it will show on your skin and in your hair. This can cause clogged pores. It is also essential to drink enough water. Water helps your body cleanse from the inside. Adding onions and garlic to your diet will also have a beneficial effect on your skin. Of course, there is a miracle ointment that will take all your problems away. There are however numerous creams and cleaning products available to help your skin. It is our opinion however that the internal cleaning works best. A healthy diet and drinking enough water will benefit your skin more than a costly cleaning product. That being said it is essential to know your skin. If you tend to have dry skin after a warm shower, makes sure to use an excellent moisturiser for your face. It does not have to be the most expensive moisturizer around, but the cheapest is probably also not a good idea. The more natural the moisturizer, the better. Make sure you don’t use a body lotion on your face. Even though these are very similar to facial moisturizer, they are somewhat different. The skin on your face is a bit more sensitive to for example perfumes in these ointments. Just make sure you use a face cream. Perfect would be twice a day before you go to bed and after you have had a shower in the morning. We hope this information is helpful for you and it will bring you the results you are looking for.